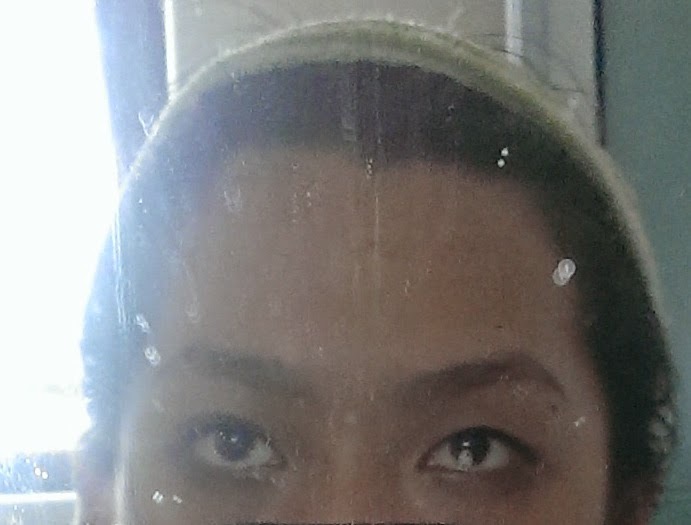 As you can see, the extra eyeliner I put on last night helped with the smudgy-ness of my undereye. Unfortunately, there’s a side effect to all that eyeliner – which I should have considered earlier. Some of my lashes (can’t be seen in the pic) seems to have fallen out. I’m not sure if it’s from my eyebrows from their shedding phase, or my eyelashes, but it doesn’t look good. However, I have learned something from this two-day experiment. My eyeshadow can actually go much lower on my lower lashline than I expected. In fact, if you look at the picture, it gives my eyes a more downturned, almost puppy-eyed look. It would also be a more intense look than, say, the atypical puppy eye look. I think I will shelve the experiment now. It’s not doing my lashes much good, and I don’t look forward to seeing black smears on my pillow in the future. It has taught me more about my eye shape. which isn’t exactly the norm for my race (I’m Chinese). I think that if I’d gone full scale as Kristen Stewart does, I’d probably lose more lashes. Sigh. On a happier note, I found my Maybelline mascara! I’d placed it in my brush holder black-head up, and it’d magically disappeared into the holder, because being the numbskull that I am, I was looking everywhere except there. It was in the middle of last night, just before bedtime for me, and this happened with my mom. It’s not the exact words, but the idea is there. FYI, for those of you who haven’t read the Mary Norton book or watched Hiromassa Yonebayashi movie adaptation, it’s about this family of tiny people living in the walls and floors of an English home. These people are called Borrowers. They basically survive by borrowing stuff from the large people living in said English home. Spoiler alert: There is a romance between the sickly human boy and the curious Borrower. It’s much more clear in the movie than the book – the latter hinted rather than showed the budding romance. I highly recommend the book. It has many different perspectives to the reader as they read it at different ages. I will be doing a review of my current mascaras soon! Watch out for it! UPDATE: It will be on Youtube.